The anti-hunting movement has overwhelmed the consciousness of the hunting industry. 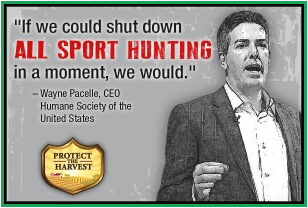 Hunters, hunting land, firearms, and the sporting way of life are under attack politically and socially. Millions of hunt-able acres are shut down in Oregon to protect the spotted owl. Lead ammunition is banned in California. Increasingly legislators, not biologists, are making wildlife management decisions. Professional huntress Melissa Bachman receives threatening messages to this day, over a year removed from the day she posted her now-famous lion photo. A deceptive foe, the Humane Society of the United States, seems to gain momentum even in the face of science, ethics and reason. The negativity and pressure has taken its toll, leaving industry leaders frustrated and searching for answers. A way of life once mandatory to sustain life is now fighting for its own life. 1) It’s just a squirrel. Again. Just a ^&#*@# squirrel. Okay, three of them are epic. One of them is a homemade video we put together to let you know Powderhook just launched the largest ever upgrade to its website. We’ll let you decide which is which!